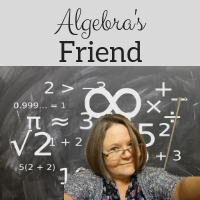 Algebra's Friend: X Marks the Spot! This past week I had the opportunity to attend our district's just in time math workshop. The focus of the day was quadratics ... primarily factoring. The goal was to introduce teachers to multiple ways to present factoring. Since I have been out of the classroom a while, I found the presentation refreshing! In the next few weeks, we will teach polynomials, and then attributes of quadratics. I plan to introduce factoring using those attributes ... as we examine the x-intercepts ... demonstrating how those roots are solutions to the equations. Obviously this limits us to very specific graphs ... ones that integer roots that are easy to see on a graph. Then as we begin to pursue factoring in earnest, we will use "flashback" to illustrate the inverse relationships between multiplying and factoring. We will use x puzzles to build number sense ... numbers that multiply to equal one number while adding to equal another number. I found these puzzles online (Sum and Product Pre-Factoring Puzzles) ... I plan to use the x puzzles even before we get to multiplying polynomials ... just as puzzles! I hope that just exploring them as puzzles before we get to factoring will reduce anxiety in factoring. Algebra Tiles will help to demonstrate the area model of multiplication. We'll use the tiles for factoring as well. I plan to use the ones at Illuminations for online practice. From there we will use the "box method" (an array) to multiply and then to work backwards to factor. One method I don't plan to use that was presented at the workshop is the "Kick It" or "Kick Back" method. It seemed contrived - a bit of math magic. If you want to read more about it, check out this blog post! I noticed that Julie at I Speak Math has a template for X-Box Factoring ... I plan to borrow it to slip into our dry-erase sleeves as we practice! I'm looking forward to our new unit ... first a few Laws of Exponents, and then ... polynomials!